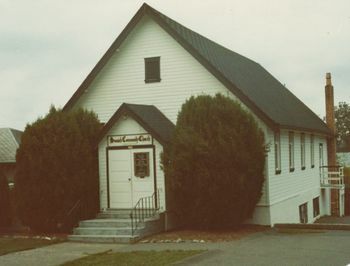 Saanich Community Church, early 1980s. In 1968, John and Evelyn Baerg were sent to the Saanich, British Columbia area by the British Columbia Conference of Mennonite Brethren Churches' Board of Church Extension to conduct outreach programs specifically aimed at University of Victoria students. Attendance at the initial services was served by an influx of migrants from the Fraser Valley. In 1970, George and Carol Brown came to the area to assist in the efforts already underway. The church formally organized with 18 members in 1971, and two years later the congregation joined the provincial and national conferences of Mennonite Brethren Churches. Initially, the congregation met in various local homes and community centers. Eventually, the church purchased a building in 1975. A subsequent building program occurred in 1988. John Baerg is considered the founding leader of the group. The congregation originated through the movement of Mennonites to Victoria from the Fraser Valley and outreach by the British Columbia Mennonite Brethren Conference. The outreach was conceived as a ministry to students at the nearby University of Victoria. In 2010 the congregation had a membership of 66 and an average weekly attendance of 105. Mennonite Reporter (19 February 1973): 18; (4 August 1975): 9. Mennonite Brethren Herald (27 May 1988): 13. Centre for Mennonite Brethren Studies: Volume 387, microfilm 69. Records kept at the church. Klager, Andrew. "Saanich Community Church (Victoria, British Columbia, Canada)." Global Anabaptist Mennonite Encyclopedia Online. November 2010. Web. 24 Apr 2019. http://gameo.org/index.php?title=Saanich_Community_Church_(Victoria,_British_Columbia,_Canada)&oldid=143014. Klager, Andrew. (November 2010). Saanich Community Church (Victoria, British Columbia, Canada). Global Anabaptist Mennonite Encyclopedia Online. Retrieved 24 April 2019, from http://gameo.org/index.php?title=Saanich_Community_Church_(Victoria,_British_Columbia,_Canada)&oldid=143014.